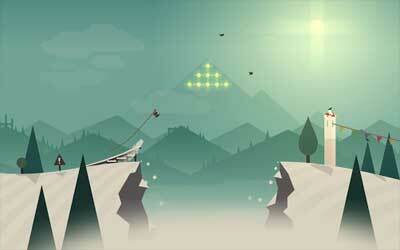 Snowboarding becomes main inspiration for developing Alto’s Adventure APK 1.3. As mobile game, you can play directly using tap and touch mode. This game have impressive graphic and visual so player does not have to worry for playing in smartphone. People call this game as endless running type because player will be going through many obstacles with no end. You will get interesting bonus and prize after get passed some levels. As mobile game, it gets highest point from popular application store and you will see good review for this game. Therefore, this runner game will offers a lot of fun and enjoyable stuff for players. As endless runner type, this game starts automatically after player activates it. You just use tap mode in smartphone to control character and jump to avoid crash. Another way to play is holding screen for interesting trick so player never get bored for just one trick. There are more than 150 goals for player such as rescuing animal on snowfield, reach distance at particular time, crossing villages, and getting through mountain faster. When player enters specific goal, he or she has to finish it as soon as possible because the chance is only three times. Once you are failed, the game back to starting point and you go again from there. After player succeeds to pass one goal, he will get award and point. Developer creates this game for interconnecting mode so you can use coin to purchase interesting stuff. Another good thing in this game is trick, which can be performed by player or combo with others. Player can use wingsuit as additional tools to solve obstacle so he will get in no time. You might see different lighting because this game incorporates cycle of day. As runner game style, Alto’s Adventure for android is save for everyone. Added Google Play Cloud Save! Just sign in to Google Play Games to have your progress be cloud saved – it will use the save with the longest play time. We also made video watching more data efficient (might cause videos to load slower – but will save your data). Fixed the “crash after ad” bug!